This map shows broadband availability in the United States. Availability is defined as at least 3 mbps download and 768 kbps upload speeds. This is from a Broadband Availability web site. When you live in a big city like Chicago you tend to take broadband access for granted. This map show that many places in America don't have such luxury. This is just one more example of how mapping data can help make it easier to connect people from different places with a common understanding of a problem that affects people all over the country. 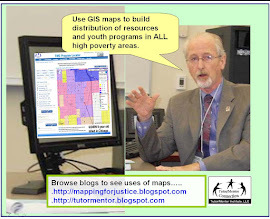 At the Tutor/Mentor Blog my article of 12/12/11 includes a map showing drop out high schools in Illinois. We need significantly more resources to map this information in all the ways we want, and to create the advertising and public awareness needed to get millions of people looking at this information. Can you help? Click here to see how you can help.